This website will take about five minutes to read and will provide you with solid information regarding the ENRADD speed detection system. This website is intended for informational purposes only based upon my opinion after studying this device for several weeks. I created this website after reading several web-blogs that failed to properly explain how this system works which only made things more confusing for people trying to obtain information about it. I have had the opportunity to thoroughly test this particular system out from end to end and have learned a great deal about it and how it works. I am also fluent on the use of several other speed timing devices such as ROBIC, VASCAR and Radar. Call it an odd hobby, but this type of equipment has always fascinated me so I took the initiative to not only study these systems hands on, but to study them well. There is a contact form at the bottom of this page should you have any questions that are not answered on this website. I will be glad to answer any of your questions, but ask that you please refrain from asking any specific legal questions as I am not an attorney. Please note, this website has no affiliation with the sales or distribution of ENRADD. ENRADD is short for "Electronic Non Radar Device." This device has become a very popular speed timing device for law enforcement officers. This device is especially popular in the Commonwealth of Pennsylvania. The reason it appears as if Pennsylvania is using ENRADD more than other states is because ALL police officers (both local and state) are permitted to use it. The device is approved for use and is recognized by the Commonwealth of Pennsylvania as an official electronic speed timing device. ENRADD was created by the YIS Cowden Group out of Pennsylvania. This company, which has a very good reputation, builds, tests and services this device as well as many other forms of speed enforcement equipment. This company also assists police departments on how to properly use these devices. ENRADD accurately detects the speed of a vehicle by using two small metal half square like shaped bars which are placed on the shoulders of the roadway directly across from one another. The first bar has two transmitters and the second bar has two receivers. The transmitters send two invisible infrared beams of light into the two receivers. The beams of light, which extend several feet across the roadway, are manufactured exactly three feet apart from one another on each bar. As a vehicle passes through these invisible beams of light, the device automatically calculates the elapsed time it took the vehicle to pass through both of these invisible infrared beams and instantaneously calculates the speed of the vehicle. The system is able to do this by using the mathematical formula of S=D divided by T. (Speed = Distance Divided By Time) The distance of three feet divided by the amount of time (milliseconds) it took the vehicle to pass both of the beams of light will produce a speed in mph. Example: A vehicle traveling at 50 MPH is traveling 58.64 feet per second. The machine calculates the amount of time the vehicle took to traverse through its three foot infrared span and calculates the speed. It is the same mathematical formula and concept used in many other forms of speed timing equipment, but done through a calibrated, tested and fully automated electronic and wireless machine which is not effected by human error reaction time. After the device calculates the speed, it sends a wireless signal to the ENRADD monitor which is located in the police car. The monitor inside of the police car will display the vehicle's speed as the vehicle passes the device. This allows the officer to clearly track and identify the vehicle in question. Prior to beginning enforcement, an officer will typically set the machine to "Lock-In" vehicles at a certain speed. 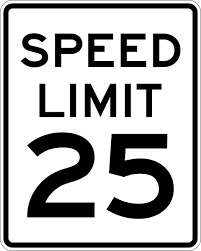 Example: If the speed limit is 35 MPH and the officer sets the Lock-In speed at 50 MPH, the machine will only Lock-In and alert the officer to vehicles traveling at 50 MPH or greater. The machine will still display the speed of each passing vehicle, but will not Lock-In a vehicle traveling under 50 MPH. In this case, upon a vehicle passing the machine at 50 MPH or greater, the ENRADD monitor inside of the police car will sound an alarm and the speed displayed will be Locked-In, thus allowing the officer to have a positive Lock-In speed on the vehicle in violation. Upon the officer who is operating this device either stopping the speeding vehicle or radioing ahead to waiting officers, he or she will then reset the device and resume monitoring traffic. The machine is able to be set to lock in speeds from 20 MPH - 120 MPH. The device is typically operated by one officer who is in charge of operating the device. This officer will monitor all traffic from a concealed location. After the officer views a speeding vehicle, he will either pull out after the vehicle and stop it himself or radio ahead to officers who are watching the traffic approach from up the street. The radioing ahead method is a much safer way to stop speeding vehicles because it requires less time trying to catch up to a speeding vehicle. If the officer chooses the radioing ahead method, he will generally inform the waiting officers the make, model, color, plate number, description of driver, etc., of the vehicle that was speeding. Once that particular vehicle reaches the waiting officers it will be stopped. This device is calibrated by a state approved speed timing testing company at least one time every 60 days to assure accuracy. The device also has a built in feature which tests itself prior to use. Upon being powered on, the device goes through three self automated tests. Besides these tests, many police departments will actually test this device on their own on a daily basis prior to use. Police departments do this by essentially timing themselves in their patrol cars which have tested and calibrated speedometers. Although this particular test is not required, many departments will do this as an added measure to assure the device is providing accurate readings on a daily basis. The device is able to time cars, SUV's, trucks, motorcycles, bicycles, etc. The device is also able to be used any time of the day or night and in calm or inclement weather. The device is able to be set up and used on small one lane roadways or on large multilane highways. If you received an ENRADD speeding ticket there are a few things that you might see on the ticket that you might not understand.
" Speed Equipment Serial Number " This is the designated serial number to that particular ENRADD device.
" Station Equipment Tested " This is the station identification number of the state approved testing company who tested and calibrated the device. "Date Equipment Tested" - This date was the last time the equipment was calibrated and tested by a state approved speed timing company. This calibration / test date must have taken place within 60 days of the ticket being issued. *Note: This date only reflects the actual state approved testing company calibration date, not today's date where the machine passed a self automated test and where it also may have been retested by the police officer as an extra measure. Pending that these boxes are filled out correctly on the ticket, the police department has shown that they have met their requirements in having the device in compliance with the law. Some Negative Points About This System. 1: Before using this device, the police officer needs to physically place both devices on both shoulder areas of the roadway. The devices then have to be measured and leveled. Being that the officer is literally just 3 feet or so from speeding traffic, this puts the officer at risk of being hit by a passing vehicle. 2: The cost to purchase this device is more expensive than many other types of speed timing devices and requires much more setup work before using. 3: They are also a little difficult to transport because of their shape. They do not weigh a lot and really aren't large, but tend to be tougher to transport when compared to other speed timing devices, such as a small hand held radar gun or stop watch. 4: Although the device is designed well and works fine on roadways with several lanes, officers may experience difficulty at times. The reason being is that when two or more cars pass through the beams at the same time, (same or opposite directions) the device may not be able to produce the speed of the vehicle in question. This is where the officer, as when using any speed timing equipment, needs to pay attention as to what he or she is doing. The device will allow an officer an accurate and positive registered Lock-In speed if the vehicles are bumper to bumper or extremely close to one another, just not if they pass the beams at the exact same time. Unfortunate for the officer who just missed out on a possible speeder; but a big break for the speeder. 5. Theft and damage. These devices have been run over and destroyed by passing vehicles as well as been stolen while on the side of the roadway. After a beam is mangled on the side of a roadway it normally needs a significant amount of rebuilding work or replacement followed by having to be re calibrated. This process can take several weeks rendering the PD without the ability to enforce speed safety. When a device is stolen a new beam must be purchased which is costly and which also takes time to get. Question: I live along side of a very busy roadway where I know Enradd is used and often see one or more police cars driving back and forth for several minutes before they begin to stop cars. Why do they do this? Answer: What you probably are seeing is the police officer who will be operating the machine doing extra testing on it to make sure it is reading and transmitting the proper speed. Police cars have certified speedometers that are tested and calibrated. They will often drive past the ENRADD beams several times before they begin speed timing to check that the machine is providing accurate readings. They are essentially timing themselves to make sure the machine is right on the mark. This is not required, although many police officers will do this for their own peace of mind. Is there such a thing as an Enradd detector and if so, where can I get one and how much are they? No, there are no detectors on the market today that will alert a driver to ENRADD. One of the reasons I believe this to be the case is because there would not be a large market for an ENRADD detector. Just about every police department (local and state police) in every state throughout the United States uses radar to enforce the speed linit. (Except Pennsylvania) Pennsylvania is the odd ball state which only allows state police to use radar, thus making radar detectors a popular device, not an ENRADD detector. Question: I received a speeding ticket through Enradd for driving at 58 mph in a 40 mph speed area. (18 mph over the speed limit!) I do not deny speeding or even traveling at 58 mph as I have a heavy foot at times. However, just before I passed the police car, I did hit the brakes and did look at my speedometer and it read 54 mph, yet he cited me for 58 mph. How is this possible because I clearly recall my speedometer reading 54 mph at the time I passed the police cruiser. Answer: You VERY well may not have not been traveling at 58 mph when YOU first observed the police car and passed it. When you hit your brakes your speed very well may have dropped from 58 mph to 54 mph. What you need to remember is that the ENRADD device is wireless and was most likely set up several feet before you passed or even saw the police car. So by the time you saw and or passed the police car and hit your brakes, the officer already had a Lock-In speed on your vehicle for several seconds prior. Remember, the officer only needs to observe your vehicle when it passes the device, not when you physically pass where he or she was sitting. The device is able to sit up to 2,000 feet away from where the monitoring police officer is located. Also note: Just for the sake of things, if you slammed on your brakes as you physically passed the device itself, (not the police car) your lock-in speed will not be much lower than your actual peak speed. This is because the machine is set up to read a speed over a three foot span. At 58 mph, your vehicle will travel 3 feet in milliseconds. The device will read your speed quicker than a camera flash going off. So even if a driver slammed on his brakes, over such a short span of 3 feet, the driver is not going to reduce the speed greatly. Should this device use a 100-200 foot timing range as speed timing lines do, applying your brakes would greatly reduce the timing speed because it is a greater distance, which would allow the vehicle to truly slow down much more. The bottom line is that a three foot timing span gives little to no room to escape so you need to monitor your speed at all times. I was stopped for speeding. The problem I have is that when I was stopped, I was in a line of traffic which was moving at about FIVE mph. I was told I was speeding before I entered the line of traffic ahead which was at a near stop. Why wasn't I stopped right after I was timed? You were probably timed several seconds prior, before you became caught up in the traffic jam which was in front of you. If the monitoring officer timed you before the traffic jam and radioed ahead to waiting officers, they were just simply waiting for you to reach their location. As they watched you approach (even at five miles per hour) they already had been informed that your vehicle had been speeding a few seconds prior. I was driving with many cars both in front of me and behind me in the same line. Why was my car stopped and not one of the cars in front of me? We were all going at the same speed being that we were all in the same line. This is probably the number one question I receive. I am able to answer it because I, myself had the same question while I watched this device in action while studying it. After actually seeing this and learning why this happens it made sense. Just for the sake of things, lets say there were 6 cars in line traveling at about the same speed bumper to bumper. Please note, the "same speed" as you will see is really not the "same" speed. It may be extremely close in speed, but not the "exact" same speed. In this example, the speed limit is 35 mph and the officer has the device set to only lock in vehicles who trip the alarm at 50 mph. Your car was Car #5 in this line. Car #1 passes the device at 49.25 mph which is under the 50 mph lock-in speed. Nothing happens. Car #2 passes the device at 49.50 mph. Nothing happens. Car #3 passes at 49.75 mph. Nothing happens. Car #4 passes the device JUST under the magic limit at 49.95 mph. Nothing happens. Car #5 (your car) passes at 50.0 mph. The device locks-in your speed and the alarm sounds. The officer observed your vehicle as the one that was just locked-in and now pursues you. Car #6 passes at 50.25 mph. Yes, also above the magic number too, but the officer is not alerted to this because your speed has already been locked in and your vehicle was the first in the pack to reach the magic number. The lock-in feature is important because it is used to assure the speed of that certain vehicle who hit that magic number. Otherwise, it wouldLo be very hard to keep track of each vehicle. Car #6 got lucky and if he would have been one car up in this pack he would have been the one getting stopped. Do local police officers use this instead of radar? Local police officers in the state of Pennsylvania use this instead of radar because there is an old law on the books in Pa which prohibits them from using radar. It's similar to an old Pa law which also makes it illegal for a car dealership to sell a car on a Sunday or the law on the books which makes it illegal to catch fish using your hands. I guess there may have been reasoning for laws like this 40 years ago but they are now outdated and serve no practical purpose. Local police officers in Pennsylvania are the o n l y police officers in the entire United States that are not allowed to use radar. Diagram of how the device and police officer(s) use the system. 1. Vehicle approaches the invisible beams of light. 2. Vehicle break (passes) the invisible beams of light. 3. Speed is calculated and sent to the police car / police officer watching the vehicle. 5. Officer either pursues the speeding vehicle or radios ahead to another officer who will be provided with the make, model, color and speed on the vehicle and who will flag the vehicle over or pull it over. 8 simply due to the fact that this is a wireless device with remarkable accuracy. I rate this much higher than ROBIC and Vascar because there is no human reaction time to contend with and it has a smart "Lock-In" feature to positively identify the speeding car in question. How To Prevent Getting A Ticket. The best way not to get a speeding ticket is to always watch your speed and be alert. If you received an ENRADD speeding ticket, it is safe to assume that the police department will be using ENRADD in various areas of their jurisdiction, and probably on a semi-regular basis. Many times we find ourselves not paying enough attention to the roadway. Speeding tickets can be costly but avoided if you drive safely. Buckle up and drive safely. Stay tuned for more traffic safety updates. COUNTY AND STATE YOU RECEIVED IT? How helpful was this website? 1 being horrible to 10 being excellent. WILL BE REDIRECTED BACK TO THE MAIN PAGE. All rights reserved. Hits since conception.